Book Challenge Day 11- Favorite Title | What are we...the Whos? If this title doesn’t scream “moving, heartbreaking, and powerful” I don’t know what does. The second I heard it, I knew I had to read the book. The facts that my cousin had already read it, said it was awesome and that it takes place in a Chicago ad agency (hello my life!) aside, the title was super intriguing. I’m happy to report that the novel itself did not disappoint. 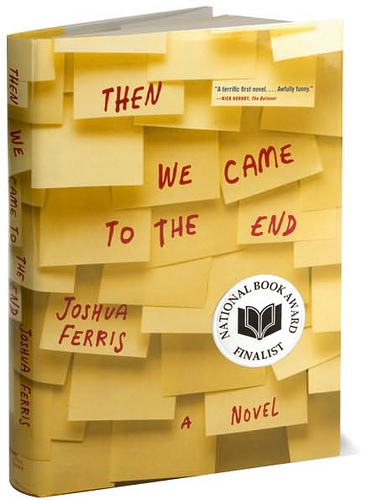 It can be hard to live up to a title, especially one this compelling, but Joshua Ferris delivered. He painted such a true picture of office life during a period of lay-offs it gave me chills. I found myself laughing and yelling “this is so my life!” a number of times (the yelling was, usually, in my head). This was a book I simply did not want to put down. We hosted a party Friday night and I was literally sitting on the couch hoping people would show up late so that I could finish the book. It was depressing and hysterical, shocking and relatable all at once. A definite must-read. If, so far, you’ve been reading these challenges and thinking, “this girl has incredible taste in books,” thank you. Also, you might be interested in my Shelfari . Posted in Authors, books, Reading, Writing and tagged 30-Day Book Challenge, Advertising, Joshua Ferris, Then We Came To an End. Bookmark the permalink. This has been on my shelf for years. I only read the first few pages (something about people being made redundant?) but I might have to give it another go in the near future. Yeah, it was a little slow starting but definitely worth it!